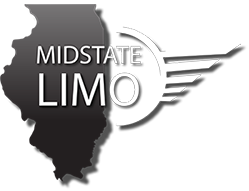 For more than 20 years Midstate Limousine has set the standard in the Central Illinois region with innovative, professional ground transportation. Our mission and culture is grounded in the belief that chauffeured transportation is more than just transporting passengers; it's about providing a unique combination of service and value to consistently exceed expectations. Bloomington/Normal is our home. It's where we live and play, so we take great pride in serving our neighbors and fellow community members with services ranging from a dazzling party bus on their wedding day to reliable sedan and SUV services in the Twin Cities and 450 destinations around the globe.